The Scentball Diffuser is a wonderful plug-in diffuser suitable for any room in your house. 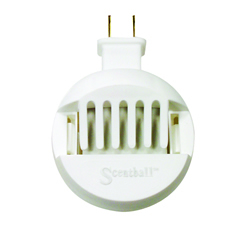 The Scentball is easy to use, safe, and diffuses an area of approximately 100-150 square feet. Ideal for a small office or bedroom. Paired with an essential oil, this would make a lovely gift! How to use: Add 2-3 drops of essential oil to the pad and insert into the diffuser. Plug the diffuser into a wall outlet and enjoy the gentle aroma of your favorite essential oil or essential oil blend. The oil pad can be reused until it begins to discolor. Includes five reusable aroma pads. Additional refill pads also available for sale. Note: We do not offer these at wholesale discounts.